I work in clay for more then twelve years now but every firing and every unloading is still exiting time. New things are born, new mistakes to learn from show up...and it was the same this time. So how was the first firing of the year? And what the teapot which I have shows you? 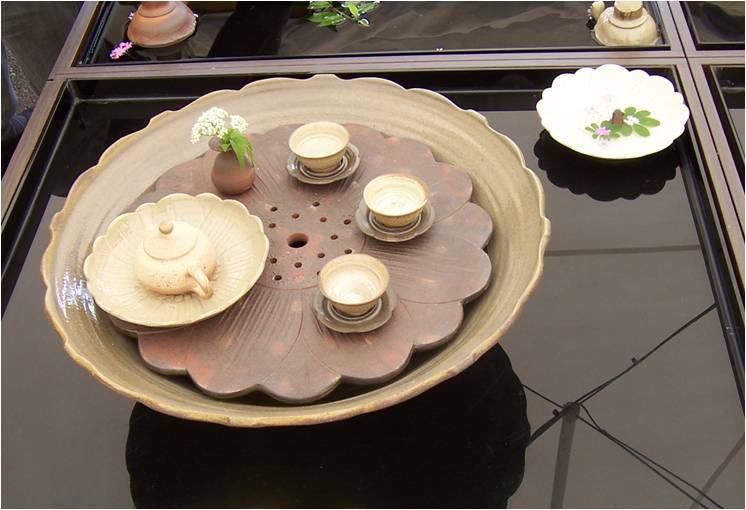 The boat is also from porcelain, with thin shino glaze on the bowl and fine, almost white celadon on the stand. For now I am still not sure which kind of tea will initiate this little one...any guesses? What make us happy are new experiments with charcoal...colors and surfaces which are very warm and pleasant. Here are some pictures..
For this I decided to take a risk and use untried-on natural ash glaze. We use ash glazes, but each ash is different and we have never try this ash combination before. Combination of meadow hay and wheat straw burned together... I got both from neighbor farmer who storage it for his horses. When he heard from me about using ashes for glazing he was so excited and curious to see the results that he has generously given me several bales of those materials. Hopefully he has enough for long winter and horses are not going to miss it. The ash comes from this countryside....I hope that some magic of it will show up on my works. When we burn wood, plant, and weed - we basically release water and carbon. In ash then stay all minerals from which the plant was build. But our burning is not perfect. Also the hay as well as strew are not clean from soil, sand or another dirt and the careful sieving is necessary. It is like washing gold, but our gold is not on the sieve. Our gold are those smallest particles on the bottom of the bucket we sieve into. Our experiences say that this can be "running" glaze so tread the lid by wadding is necessary. Also wadding under teapot can protect it in case that ash will run down. As cold days are not something what I am probably going to get use to, especially when our new studio is still without comfortable heating, a cup of tea keeps me company since morning to evening. The company, which cheers me up. What is my winter tea? What is my cup for cold, chilly morning? I have realized that there is not simple answer. Each morning is different. I usually have several kinds of tea, which tell me "I can be the one for freeze morning, I can help you out". But not always there is the right energy to choose with deliberation, in chilly air - there is time for intuition. Surprisingly for myself, I quite often choose KouCha - Japanese black tea. So I decided to share it with you. This one I got like a generous gift from my friend (thank you again, Antonio) and it is from menu of one of the best supplier of Japanese teas I know - TeaMountain. On webpage they say: „Rarity made from Kousun cultivar on farm of Mr.Katahiry in Nunusowa village on Shizuoka. June 2010. The tea was made directly for us as our own special commission." And good reputation of those people says that it is not only nice story. Very promising is even smell of dry leaves- citrus or lime fragrances with slight, cinnamon like spices in it. Light roast. Maybe this dry leaves talk to me in the morning. .The liquor is dark but bright. The dominant character is uncommon combination of lime and some salty "Japanese" in it. It is tasty. If the first look at dry leaves tells us that it is "dark dark" tea the look at wet leaves shows combination of dark green, light brown as well as dark brown leaves. I usually make three full-valued infusions. The woodfired shiboridahsi pictured below helps me enjoy the tea even in cold morning while I light fire in the fireside. I am usually not big fan experiments like this. But in this case there is originality and it doesn't try to look like something else. The winter cup in front of our "bamboo forest"
The cup I have fallen for this winter and which I like to use for darker tea was made by Mirka - my girlfriend and colleague. 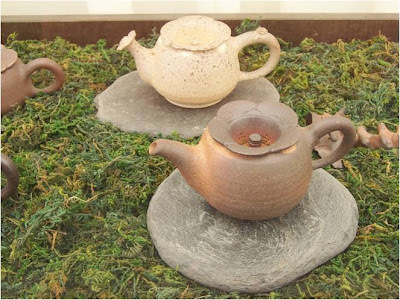 Although it was originally created in series like sake cup or shot (as there is not many sake drinkers in Czech Rep.) most of them have been picked by tea fans as winter cups.